At Krossover, we believe in full transparency when it comes to the sales team. To put this belief into action, we wanted to take high-level sales activities such as calls made, pipeline created, revenue made, & week-over-week growth and display it for the entire office to see. With new sales data being generated every minute, we needed a way to display this information to the whole team without having to update anything manually. The dashboards had to look pretty too. 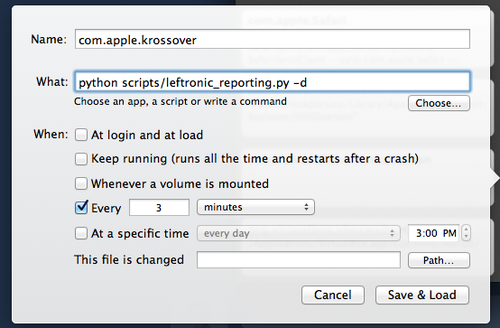 After tinkering with a few dashboards-as-a-service platforms, we picked Leftronic because their push API is simple to use and already having a Python package didn’t hurt either. Then we just needed to push data to Leftronic. We use Close.io as our CRM. Our sales culture and process depends heavily on calling prospects and customers, and Close.io fully integrates VoiP phone calls. It’s a great fit for us, especially because all of your data is easily accessible via their API. I highly recommend Close.io for any B2B startup that wants to get serious about sales outreach (more on this later). Here’s how we made our awesome live sales dashboards using Leftronic, Close.io, and a simple python script. The neat thing about Close.io is that you can get almost any reporting or search query page to generate a JSON response. Close.io outputs all currency in cents, so you’ll need to divide by 100.0 and put the decimal point in the right place. The most rewarding widgets for us are line graphs and sparklines. Since our data is being pushed every couple of minutes, Leftronic logs each time it receives new data and gives you a couple of options for which duration of time you’d like to display. So if you are tracking week-over-week growth (if not, you should start), you can visualize the data over time by sending continuous updates to Leftronic and let the data pile up over time. 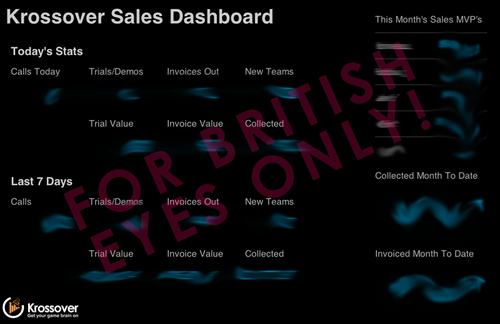 Do you have sales dashboards? What are some KPI’s that your team tracks? I welcome any feedback/questions in the comments below or drop me an email. See examples and code snippets we put together for sending Close.io data to Leftronic on Github. Thanks to @philfreo and @wojcikstefan for their help!